I have in a little hurry in choosing a wedding ring. But if other girls would finally make a decision and that's it, i become more and more interested in what I'm really buying. So yes, I'm interested in DIAMONDS. I have this little issue with my own personality. When i don't know something - i learn, when i am curious about something - i search for information. So not as surprisingly I've started reading everything i can find on diamonds and what should i personally know when buying one. I remember how some years ago i heard that when choosing diamond you should choose that stone that is the most bright and sparkle. In a way this description of a quality diamond is true. As the better cut and the better colour - the better the end sparkle and beauty of the diamond. But if you are like me, you would really want to know more about diamonds and the quality of them. I hope this little guide will help you out and possibly will make you search for more information. There are three categories which will determine diamond's total quality. All three of them will drastically affect on the price of the diamond but not necessarily will affect on the look of the diamond. one metric carat = 200 mg = 1/5 gram. The carat is subdivided into tenth, hundredth and lately even thousandth. Very small brilliants are measured in "points"; one "point" is equal to one hundredth of a carat (0.01 ct). Commercially, however, diamonds of one group are priced differently: a brilliant of 0.99 ct is roughly 10-15 % cheaper than a brilliant of 1.01 ct of the same quality. But the difference in size of them is so small, that you wouldn't really see it clearly. So we determined the size of the diamond. Next comes how well diamond was cut. When you look on the diamond from the top with the loupe, you will see the cuttings looking like an arrows. When looking from the bottom of the diamond, there will be hearts shaped cuts. I would suggest to ask if you could possibly see the diamond with the louple in your jewel store. REMEMBER: For grades F through SI, a diamond's clarity grade has an impact on the diamond's value, not on the unmagnified diamond's appearance. So you could say that diamonds with VVS and VS grades are excellent choices for both value and appearance. But if you choose to buy an I1-I3 diamond, know that some people will look at it and immediately see the flaws -- and not just experienced jewelers. You can see in the lower picture at what point the flaws in a diamond start to be seen with a naked eye. Or the colour of the diamond. There are different names used for naming the colour of the stone. When i was in one jewel store i was told by seller that the stone was rare top wesselton colour. And honestly at that moment i had no idea what she was talking about. Yes that stone was beautiful ( and expensive ) but that name told me nothing. Luckily now i know what it means :) In the lower picture nimikkeistö = name , väri = colour . Sorry for Finnish language there, but i simply could find a better picture of all the names used for same colours. *Warning, the colours of the diamonds are not shown there as they would be in a real life. The whiter the diamond is - the more beautiful and expensive it is. For example price for a 1 carat diamond will rice 500-700 euros when the colour quality goes from H to G.
So basically if you want both good appearance and value for your diamond, i would suggest to choose the quality no lower than SI and the colour no lower than H (Wesselton). The diamond size and shape is something that is more of a taste thing. Then again each of the diamonds are individual, so even a low colour level and a low cutting quality can still make the diamond ring look beautiful. So don't get all blinded by the names. 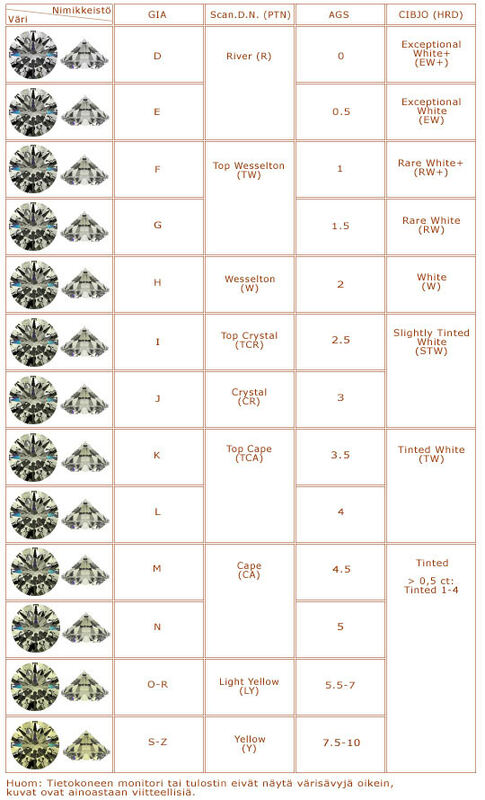 I just hope this information will make it easier for you to compare different stones to each other and get the right price. There is always a little problem when buying a ring with a long line of a smaller diamonds. If you buying a solitaire diamond ring you will have a document which will tell you what size, what colour and what cut it has. But when you buy a ring with a diamond line , there is more likely to be written just an average value or a gap between which the stones are. The risk is that there can still be an even lover level stone in the ring. So i would suggest for you to take the ring to some other jewel store and ask for value check.